Obagi CLENZIderm M.D. Therapeutic Moisturizer 1.7oz. This moisturizer replenish this lost moisture to ensure that the complexion remains healthy and balanced. Many acne treatment products are designed to eliminate excess oil and they can leave the complexion feeling dry, tight and irritated. Obagi CLENZIderm MD Therapeutic Moisturizer helps replenish this lost moisture to ensure that the complexion remains healthy and balanced. The hydrating ingredients reduce flaking, irritation, tightness and itching while creating a softer and smoother texture. This non-comedogenic formula will not clog pores or cause your acne to worsen. Adding this moisturizer to your acne skin care routine will keep your complexion healthy while preventing breakouts and blemishes. - Glycerin hydrates skin and locks in moisture. - Dimethicone forms a barrier to prevent moisture loss. - Replenishes skin after intensive acne treatments. You're reviewing: Obagi CLENZIderm M.D. 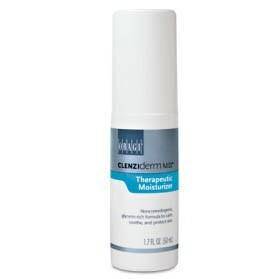 Therapeutic Moisturizer 1.7oz.